Security forces have arrested some 500 pro-democracy sympathisers across Syria after the government sent in tanks to try to crush protests in the city of Deraa, a Syrian rights organisation said today (26 April). The EU condemned the "violent repressions". Syrian rights organisation Sawasiah said it had received reports that at least 20 people had been killed in Deraa since tanks moved in on Monday, but communications with the southern town where the protests against President Bashar al-Assad began on 18 March had been cut, making it hard to confirm the information. Diplomats said the figures for civilians killed could be as high as 50 in Deraa and 12 in Mouadhamiya, which lies on the road to occupied Golan Heights southwest of Damascus. "The regime has chosen to use excessive violence. It worked in 1982, but there is no guarantee it will work again in the age of the Internet and phone cameras," said a senior diplomat, referring to the 1982 crushing of a revolt in the city of Hama, which killed up to 30,000 people. 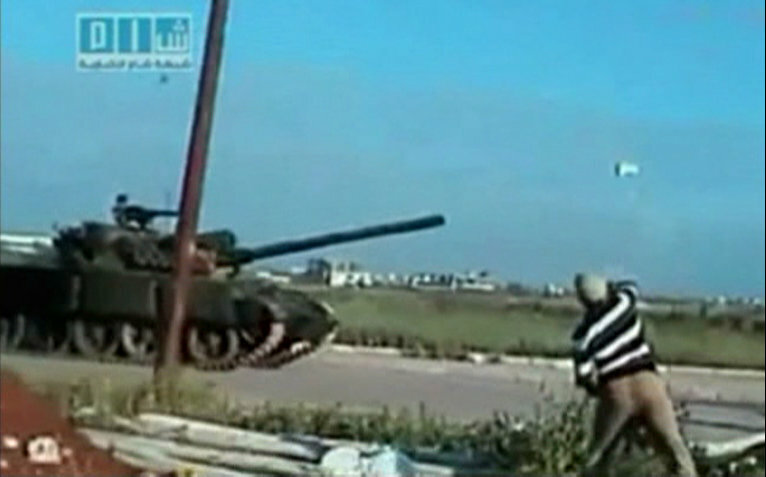 Footage posted on the Internet by demonstrators in recent days appears to show troops firing on unarmed crowds. In the Damascus suburb of Barzeh residents described security forces firing at unarmed protesters from a heavy machinegun mounted on a truck. "By resorting to the use of artillery against its own people today, the Syrian government has shown its determination to crush the peaceful protests at virtually any cost, whatever the price in Syrians' lives," said Malcolm Smart, Amnesty International's Middle East and North Africa director. Government forces also stormed the Damascus suburbs of Douma and Mouadhamiya on Monday, shooting and making arrests, a day after they swept into the coastal town of Jabla, where at least 13 civilians were killed, rights campaigners said. EU High Representative for Foreign Affairs and Security Policy Catherine Ashton condemned the violence and called on the Syrian government to carry out "profound political reforms". "I condemn the use of brutal force against demonstrators across Syria, which is resulting in high numbers of victims. The Syrian authorities must immediately stop their violent response and fully respect citizens' right to peaceful demonstrations," Ashton said in a statement published on Friday. The White House, deploring "brutal violence used by the government of Syria against its people," said President Barack Obama's administration was considering targeted sanctions to make clear that "this behaviour is unacceptable". Syria has been under US sanctions since 2004 for its support of militant groups. Several Syrian officials, among them Assad's cousin Rami Makhlouf, a tycoon, are under specific US sanctions for "public corruption". According to analysts, Obama's response to the Syrian crisis has been limited compared to Washington's role in a NATO-led air campaign against Libyan leader Muammar Gaddafi's forces and its call for his ousting. Washington is mindful of its limited ability to influence Damascus, which is already under a set of US economic sanctions and is closely allied with US foe Iran. The Obama administration is also worried about stoking instability on US ally Israel's borders and wants to avoid another military entanglement in the Muslim world, where it is involved in wars in Iraq and Afghanistan. Strong measures against Syria by the UN Security Council, similar to those against Libya, are seen as unrealistic, due to the long-standing strong ties between Damascus and Moscow, Euronews reported. The International Commission of Jurists (ICJ) called on Friday upon the UN Security Council to take concrete measures to ensure the immediate protection of peaceful demonstrators and other persons whose lives are under threat from the ongoing violent crackdown by Syrian security forces. The UN Security Council should, as a matter of urgency, consider options to ensure the immediate protection of the population in Syria. "The international community has failed so far to protect the people of Syria from wide-scale human rights violations, including the right to life," said Wilder Tayler, ICJ secretary-general. "The UN Security Council should address this deplorable situation in Syria with a view to establishing accountability for the perpetrators and justice for victims," Tayler added. The Baath Party, which seized power in Syria nearly 50 years ago, has governed under emergency laws and banned all opposition. Other grievances against the authorities include the dominance of Syrian President Bashar al-Assad's minority Alawites over the Sunni Muslim majority, corruption, economic hardship and the rising cost of living. In recent weeks, Bashar al-Assad, 45, faces the gravest crisis in his 11-year rule as anti-government protests sweep across the country calling for political freedom and an end to corruption. The soft-spoken Bashar took office after the death of his formidable father Hafez al-Assad, who brooked no dissent and refused to buckle during the Arab-Israeli conflict for 30 years. Under Bashar al-Assad, Syria has been Iran's closest Arab ally, a major force in Lebanon, and a supporter of Palestinian and Lebanese militant groups. The United States resumed full diplomatic relations with Syria last January. However, tensions have grown again over neighbouring Lebanon, where Damascus ally Hezbollah has gained the upper hand in a political crisis.